ONI Bureau: The cyclone ‘DAYE’ triggered heavy rains in several parts of Odisha on Friday, continues its effect in several districts of the State on Saturday. The districts including Bhadrak, Balasore and Malkangiri has been worst affected by the cyclonic storm ‘Daye’. Baitarani River crossed danger mark near Akhuapada in Bhadrak. The current water level is at 18.05 metre against danger mark of 17.83 metre. Heavy rain destroyed large scale of crop fields in Bhadrak. Likewise, 2 gates each of Sunei Dam & Kala Dam opened as river levels flowing through Balasore district cross danger mark. The current water level is at Budhabalanga flowing at 8.18 mts near Baruni bridge against danger mark of 8.13 mts and Jalaka River flowing at 6.51m near Mathani against danger mark of 5.80m. Road communication between Malkangiri and Balimela was disrupted as water is flowing five feet over the MV-11 bridge. Road connectivity between Malkangiri and Kalimela has also been lost due to 3-feet flowing of water over Poteru bridge. 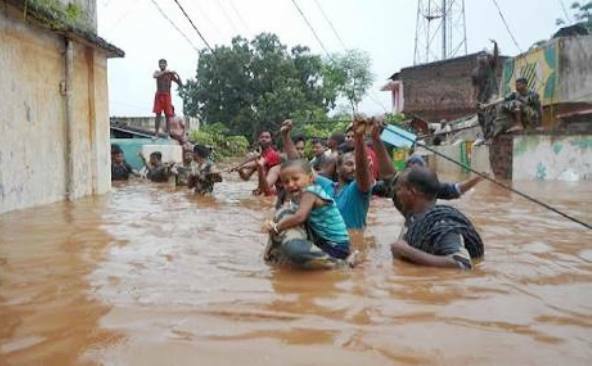 Many villages cut off from the rest of Odisha as road washed away by the flood water and landslide occurred in several areas. Odisha Disaster Rapid Action Force (ODRAF) and National Disaster Response Force (NDRF) teams deployed at Bhadrak, Balasore and Malkangiri districts to help in rescue and relief operations.